Jon Favreau's live-action/animation hyrbid The Jungle Book gains another member of of its increasingly star-studded cast. Possible proof that Hollywood is running out of ideas, moviegoers will have not one, but two, movies based on Rudyard Kipling's The Jungle Book. 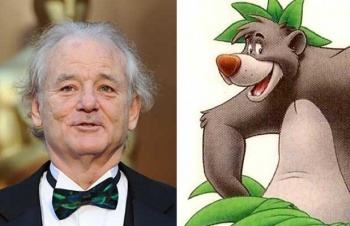 Over on the Disney side, Bill Murray (Ghostbusters) has joined the cast of the live-action/animation hybrid The Jungle Book, and will play Baloo the friendly bear who befriends the human orphan Mowgli. While Murray is the latest actor to join the cast, it's been known that other Hollywood actors have already been signed with Christopher Walken (Stand Up Guys) voicing King Louie the orangutan, Giancarlo Esposito (Breaking Bad) as Akela the grey wolf, Lupita Nyong'o (12 Years a Slave) as Raksha the wolf mother who adopts Mowgli, Ben Kingsley (Iron Man 3) as Bagheera the panther, Scarlett Johansson (The Avengers) as the hypnotizing snake Kaa, Idris Elba (Prometheus) as the main villain Shere Khan the tiger and newcomer Neel Sethi playing Mowgli. Justin Marks is penning the screenplay, with actor-director Jon Favreau (Iron Man) helming for a scheduled October 9, 2015 release. This film is not to be confused with Warner Bros. Pictures' live-action The Jungle Book adaptation called Jungle Book: Origins, which will be the directorial debut of Andy Serkis (The Lord of the Rings). Can this be a good thing -- especially for those who have fond memories of the 1967 animated classic? Regardless of how it fares, let's hope Murray belts out his own rendition of "Bare Necessities" just to make things worthwhile.